You know, I've never been one of those people who believed that death "comes in threes". I think it's silly really. If you want to think about death coming in numbers, not to sound morbid, but try thousands. Think about it, people die all over the world, all day, every day. The regularity of the occurence doesn't make it any less scary or emotionally painful for those of us left on this side of the great beyond...but there's nothing to be superstitious about. (I say, while wondering if I'm typing this as some kind of subliminal precursor to my own sealed fate.) But I do believe that as I am getting older, what people really mourn as their favorite celebrities or personalities die is their own youth. When I was a kid, it didn't hurt me when someone like, oh say, Frank Sinatra died. Why? Because I hadn't grown up listening to him. I knew it was a big deal when he passed, I just didn't feel it. Now, as I am getting older, death packs a pop culture whallop to me left and right on a fairly regular basis. Lately, it's been so many celebrity obituaries that have made me wrinkle a brow or shake my head and say, "What a shame." Cyd Charisse, Bettie Page, amazing character actors like Paul Benedict (Who I remember best from, "The Man With Two Brains" and "This Is Spinal Tap".) 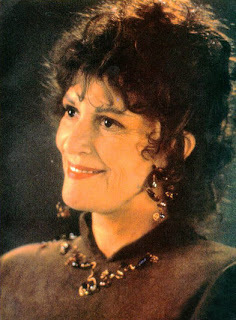 and the one that hit me the hardest, Majel Barrett Roddenberry. Any woman who can be on the screen with Patrick Stewart and just OWN the space and make Stewart look, I don't know, smaller, deserves major respect as an actress. It felt like one of my aunts had passed away. She wasn't just the voice of the U.S.S. Enterprise to me, she was the voice of my imagined future and what I hoped the world could be like someday. Now another Trek icon has moved on, Ricardo "Khan" Montalban. Yes, as I age, I feel the weight of those great departures. Because (old fogey moment coming in 3...2...) they literally don't make 'em like they used to. Well, the same amazing range of humanity is pushed in and out of being, but the entertainment industry is a different place and it's so rare to see that kind of talent or uniqueness allowed past the golden gates of Hollywood or even onto Broadway. Now, everyone looks like a soap star or a plastic surgery freak or a barbie doll. Now, everyone's personal life is on full display and actors can less often just be known for the work they do. Films are pushed out faster and t.v. shows can no longer have adequate time to develop. It's not so much that it hurts me emotionally when these great entertainers die, I've never known them personally, obviously. It's more so what their passing represents, which I guess is something different for everyone. But for me, it's that I fear there will never be a future in which regular looking people or character actors or weird and different ideas will appear on any screen anywhere. It's all remakes from here folks, not even original Trek material...nope. A stupid reboot. Which will no doubt be oversexed and dumbed down. So goodbye Ricardo, I liked a lot of your work. You really scared me as Khan when I was a kid. Honest. I appreciate what you added to the Star Trek Canon. Thanks man. (I'm honestly hoping that God is the kind of, um...guy, who will see you and go, "Khan!" and then you two will have a good laugh together.